Not much was left after Asiatic garden beetles finished eating my sunflowers. Japanese beetles remove tissue between veins causing skeletonization. A few weeks ago we learned about the misery Japanese beetles levy on our ornamental plants as they munch leaves and flowers of our trees and shrubs. 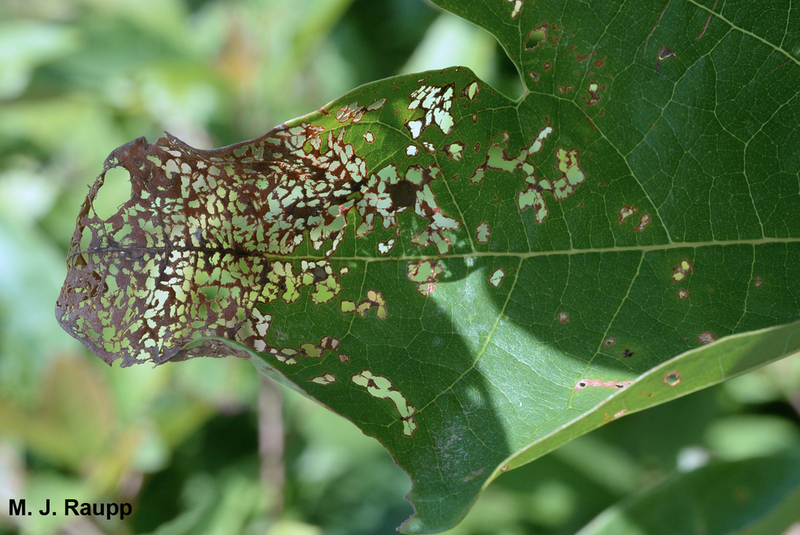 Skeletonization, the removal of soft leaf tissue between tough leaf veins, is the signature damage caused by these pesky herbivores. Over the past week or so another type of damage appeared in force on leaves of my sunflowers and butterfly bush, and flowers of my Shasta daisies. Great chunks of leaves and flowers vanished seemingly overnight. Repetitive and thorough daytime plant inspections failed to reveal the perpetrators of this assault. However, a midnight’s visit to my butterfly bush revealed hordes of Asiatic garden beetles busily stripping away the foliage. Asiatic garden beetles are close kin to Japanese beetles we visited previously. Like Japanese beetles, these invaders from Asia were first detected in New Jersey. Their discovery in the Garden State in 1921 followed the earlier discovery of Japanese beetles in 1916. Asiatic garden beetles now range from Canada to Florida and west to the Mississippi. As adults, these rascals are known to eat more than 100 species of ornamental plants, but they can also be important pests of vegetables, including corn. Larvae of Japanese beetles and Asiatic garden beetles feed on plant roots and are called white grubs. Like Japanese beetles, the six-legged larvae are soil dwellers shaped like the letter “C” which go by the name of white grubs. They feed on roots of a wide variety of weeds and herbaceous plants, but they can be particularly damaging to cool-season grasses. Recorded densities can be as high as 100 per square foot and, not surprisingly, turf can be severely damaged at these levels of infestation. Adults wreak havoc on plants through July and into August, moving between feeding sites on plants to the soil where females dig into the earth and lay eggs. Each female lays roughly 60 eggs during her four week lifespan. Eggs hatch from July through October and grubs consume the roots of plants before moving deeper into the earth with the approach of winter’s cold. With the return of warm temperatures in spring, grubs return to the root zone to feed and complete development. Pupae can be found in the upper six inches of soil during June and July, whence adults issue forth to visit their desolation on above ground portions of plants. As with Japanese beetles, I learned that Asiatic garden beetles are very poor swimmers and brushing them into a container of soapy water put an end to their mischief. Floating row covers can exclude beetles from plants and may help prevent damage to vegetables. Applications of white grub-infecting nematodes may also prove useful in reducing populations of flower beds and turf. Adequate soil moisture is critical to the survival of eggs on Asiatic garden beetles and other members of their clan. Withholding irrigation of flower beds during times of adult feeding and egg-laying may encourage adults to lay eggs elsewhere. Drought may also reduce the survival of eggs and a dry July and August may translate into fewer beetles a year downstream. Unfortunately, with plentiful rain this spring and early summer, my money is on a bumper crop of Asiatic garden beetles and their kin, including Japanese beetles, in 2015 in the Washington-metro region. Midnight snacking of Asiatic garden beetles ravaged my sunflower.